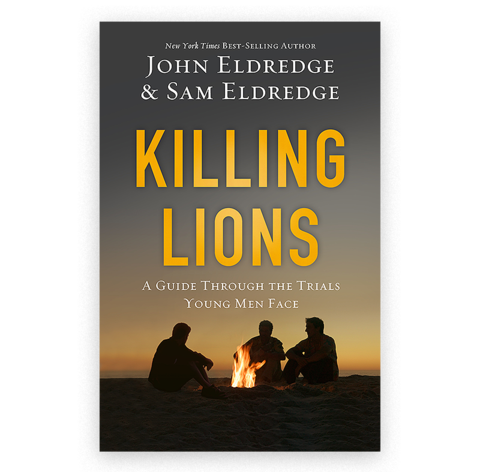 The book "Killing Lions" is a conversation between John and Sam Eldredge about the trials young men face. [John] I was watching a remarkable documentary on the Dorobo hunters in southern Kenya. Their bows simply aren’t strong enough to bring down big game, so they steal the kill off lions. In a stunning display of courage and cunning, they walk right up to a pride devouring a wildebeest; their unwavering confidence causes the lions to run off. In the next scene the men are roasting wildebeest flank over an open fire, talking, and laughing. One of them says, “But not everybody fights lions; some people are cowards.” That is the campfire you want to be at—the feast of the daring. This is going to take courage, because fear is the number one reason men give up, sell out. It will take perseverance because nothing worth having comes without some kind of fight. It will take cunning because most men-who-are-really-still-boys move into the world with a childish naïveté, ignore the lions, fail to reach their dreams, and then blame the world or God when in fact they were simply insisting that life allow them to remain freshmen forever. You have a number of lions to slay—fear is one. Despair is another. Entitlement—the entitlement of adolescence—is a third. Either you kill them or they eat you and your dreams for dinner. Courage, perseverance, cunning—that’s how you kill lions. Live that and you will have a story worth telling.